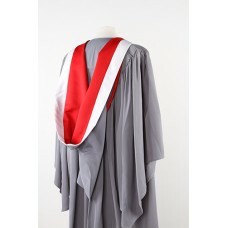 Academic hoods, often referred to as colours or silks, go with a gown and probably (but not always) a hat to give you the full academic dress as worn at Graduation. Hoods come in a very wide range of styles and shapes, many colours, fabrics and specifications. Normally each design is specific to a University, College or other Awarding body and it will represent not only the institution involved but also the level of the award gained, and potentially the faculty or even subject studied. 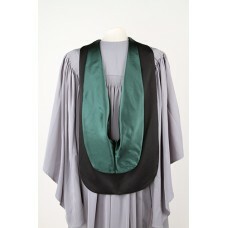 A few Universities use the same hood for Bachelor and Masters level awards and vary the gown but this is rare. When you wear your particular gown, hood and hat this fully demonstrates not only where you studied but also your level of award. Due to the vast numbers of options available, we ask that you email us with your academic hood requirements; we will let you know very quickly if we hold your item in stock or, if not, the price and lead time to have one made. Because so many options exist and some of the fabrics are very specialised, hoods are relatively expensive items to make: this is normally reflected in the price. 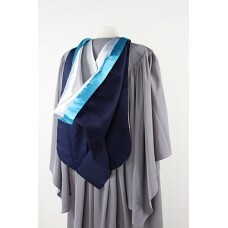 Partly for this reason we find that many teachers (with a need to wear academic dress for special events, assemblies etc) chose from our range of affordable generic hoods that are not allocated to a specific institution or award but still look very fine when worn with one with one of our gowns. Whilst our hoods are normally very suitable for use at Graduations, we are always slightly cautious about recommending this where we are not the Official Robe maker. Usually a University will have a contract with an official supplier and you may not be allowed to cross the stage if you are not wearing full and correct academic dress. Our hoods will conform to the regulations involved but may differ in shade from those provided by the Official Robe Maker and this may make you look different from your colleagues as you cross the stage. Since it is your responsibility to ensure you wear the correct academic dress at your Graduation and it is such an important day for you and your guests, we strongly recommend you explore all options with the Official Robe Maker first.